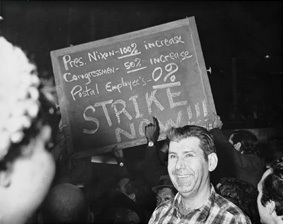 The APWU was founded on July 1, 1971, the result of a merger of five postal unions. The two largest unions involved in the merger were the United Federation of Postal Clerks, which represented those who "worked the windows" at post offices and those who sorted and processed mail behind the scenes, and the National Postal Union, which claimed members in each craft. Both traced their origins to the National Federation of Postal Clerks, which was created in Chicago in 1906. Four months before the Postal Reorganization Act was signed into law, U.S. Post Office Department management and postal unions announced a joint agreement on a reorganization plan. 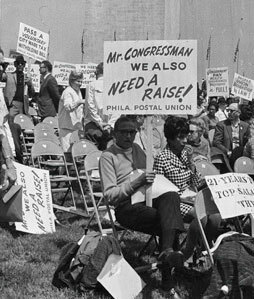 When the PRA became law on Aug. 12, 1970, it created the United States Postal Service, which on Jan. 20, 1971, participated in the first collective bargaining session with seven postal unions, including five that were soon to merge into the APWU. The APWU can trace its history as far back as 1874, when the Railway Mail Mutual Benefit Association (RMMBA) was formed. While the railroad clerks were mainly interested in securing a low-rate life insurance plan, the "MBA" also tried to lobby for improved wages and working conditions.